After they married in Montgomery, my grandparents relocated to Detroit. They roomed for awhile with the Walkers, who were not blood relatives but related through marriage. Mrs. Emma Topp was also a roomer in the house. 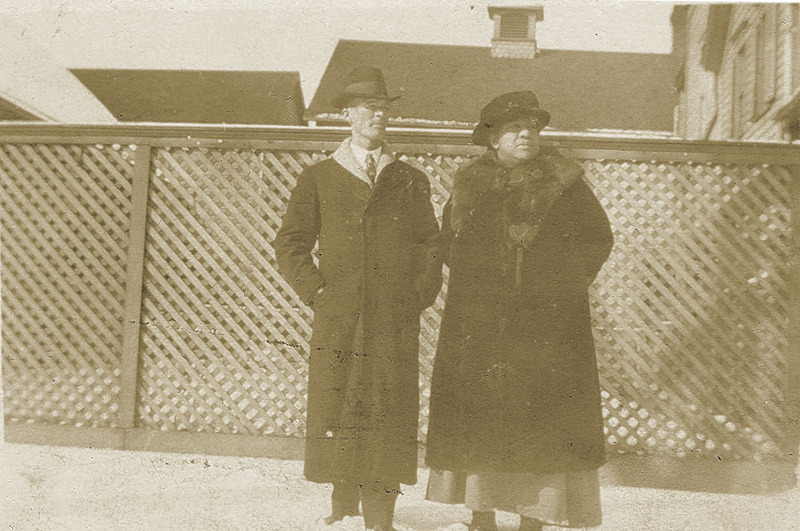 My grandfather Mershell Graham and Emma Topp in the Walkers yard. 1919. Mrs. Emma Davis Topp roomed with Moses and Jean Walker after her husband died in 1912. Her husband, John W. Topp had been an engineer. He was a black Canadian who arrived in Detroit at age 17, in 1875. Mrs. Topp was born in Mississippi and attended school through the 8th grade. She was a dressmaker. By 1930 she had moved to Los Angeles, CA and was living with her cousin and aunt. 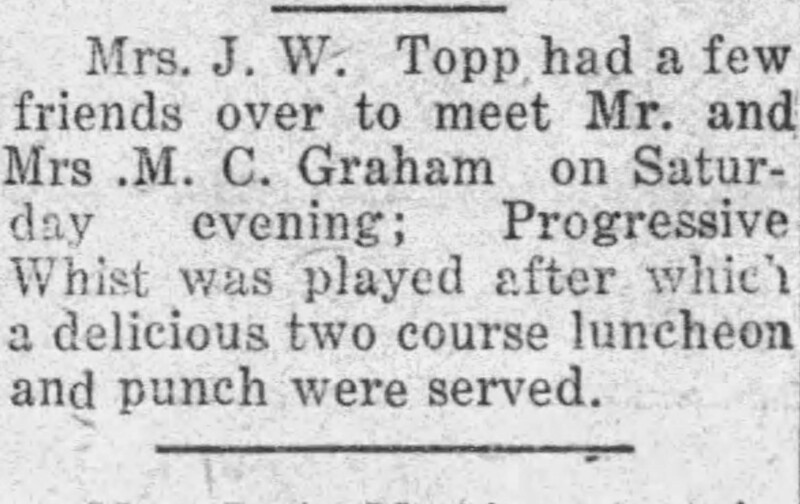 Mrs. Topp was no longer working and lived with her cousin until her death in 1948. I found this information on Ancestry.com in Census Records, Directories, Death Records, Military Records and Marriage Records. The news item was found on Newspapers.com. That seems like such an odd thing to find in the paper 🙂 What a lovely window onto life. Lots of items where “a delicious lunch was served” but they never go into details. Now I have to find out how you play Progressive Whist. I wish I could find a newspaper site that would give us such details about our grandparents – and parents. I posted some information above on Progressive Whist. I had to google it too. There was a lot of Progressive Whist played at gatherings. I was overjoyed when “The Emancipator” came online with all this information. I found the “Detroit Tribune”, which was published by the same person after he moved to Detroit. It also has a lot of family information, unfortunately it isn’t indexed and the copies are often faded to illegibility. These papers functioned the way a small town paper would for the African American Community in those cities. Good catch! When I was in Rangers (Girl Guides) we did a service helping out at a community center and a table of Whist players needed a fourth so I sat in. It was fun, but it was the only time I ever played. Whist is the predecessor to Bridge, which my parents played. I found one of my Scotland ancestors in the newspaper playing Whist. It seems the most popular that were mentioned in the papers were Chess, Checkers and Whist, although I did find some mention of Loo and Euchre. Most every city had a Whist Club, or other game club. I don’t think I ever played whist. I love those old papers and the things they carried–definitely small-town, but even the small-town paper when I was growing up didn’t carry notes about who had people to dinner, so it’s also because it’s a different era. Not sure if the paper I was thinking of had who had who to dinner, but they did have which out of town guests were visiting who and what person from the town was visiting out elsewhere. For sure a different time. I love the way those snippets of social life featured in papers. I suppose it’s the same as the photo of your lunch posted on Facebook, tagging the people you were with, but it still seems so quaint. Things seem different in black and white as opposed to digitally. Sounds a very successful day. I like playing card games our favourite is 500 https://en.wikipedia.org/wiki/500_(card_game) as lots of people we know know the rules and it becomes a social thing to do. Bridge is much more serious. I find it easiest to learn card games from somebody who knows the rules and can show me. Reading them doesn’t make so much sense. In the family we often play Rumy 500 https://www.grandparents.com/grandkids/activities-games-and-crafts/rummy-500. When I’ve played with friends we play Spades https://www.pagat.com/boston/spades.html. I do that so rarely, I need a review every time. Well, I love that PROGRESSIVE Whist is similar to plain ol’ everyday Whist but that doesn’t help me much. I love Mrs. Topp’s coat. This reminds me of the newspaper in the town where my mom grew up (well, actually, a neighboring town that was bigger and had a newspaper – the town my mom grew up in had a population of just over 400). All the little towns in the area had someone who submitted “items” for the paper, and they were listed in a column under the town’s name. The items read just like the one you posted, only the actual meal was usually spelled out! When my brother and I would go visit my great aunts who still lived there, they would call the lady who wrote the items for the paper and tell her about our visit, and in the next week’s paper would be an “item” that we had visited our great aunts and would list anything special we did while there. Love seeing your post about it. Brings back precious memories!